In September/ October 2018 Albert Wittkamf and operation assistant Petra Meerwijk, visited the Oral and Maxillofacial department of the Kilimanjaro Christian Medical Center (KCMC) in Moshi for 2 weeks. This department is still in the founding fase with dentist dr Rwakatema as temporary department head. The intended successor (dr Kanankira Anandumi) is currently being trained in Dar es Salaam and he is expected to complete his initial training mid 2019 after which he will become a staff member at the KCMC. He must then complete his masters degree with, working under supervision for two years, to be recognized by the East African College of Surgeons. The provost for Academic Affairs for the KCMC, Prof Kien Mteta, will commit himself to arrange this conform the College rules. 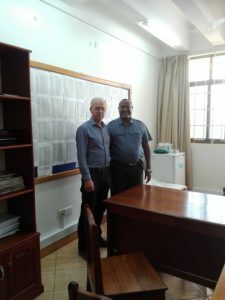 On his visit Albert had brought five suitcases full of instruments and devices for the department to make them ready to function as a full-fledged department next year alongside with the department in Dar es Salaam. The Oral and Maxillofacial department in the KCMC will be the second department in all of Tanzania!! This donation is an addition to the large donation made in 2016. Dr. Albert Wittkampf has also assisted and instructed dr. Kanankira for more than a week during several operations. An important breakthrough was reached when they managed to install the orthopantomographic device in such way that it is now fully functioning. This visit has underlined that support in expertise and materials are still necessary for some time to go but is has also proven to be very effective.